Spring is the perfect time to add touches of nature indoors! 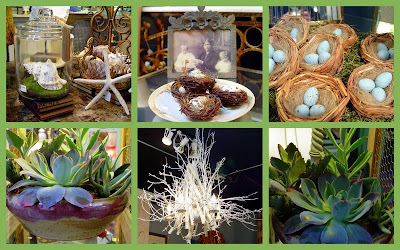 Home decor that welcomes gifts of creation becomes organic, restful, and interesting. Driftwood, rocks, pine cones, twigs, sea shells, seed pods, egg shells, plants, and flowers are only a few of the objets d' nature that help us celebrate the ever changing colors and patterns found right outside our front door. Nature objects found on a vacation or get-away week-end remind us of an experience we shared with someone we love. Given a focal point in a room, they connect us with the loved ones we shared the place and time with. How much more meaningful is that than buying a trinket from a gift shop? Sea shells can be stacked in a jar, set on display in a crystal bowl, or glued in a unique design in a velvet-lined picture frame. Twigs can be clustered into bundles and wrapped around tin cans with raffia to make unique vases, or twisted around an old chandelier to create an effective and beautiful new one! 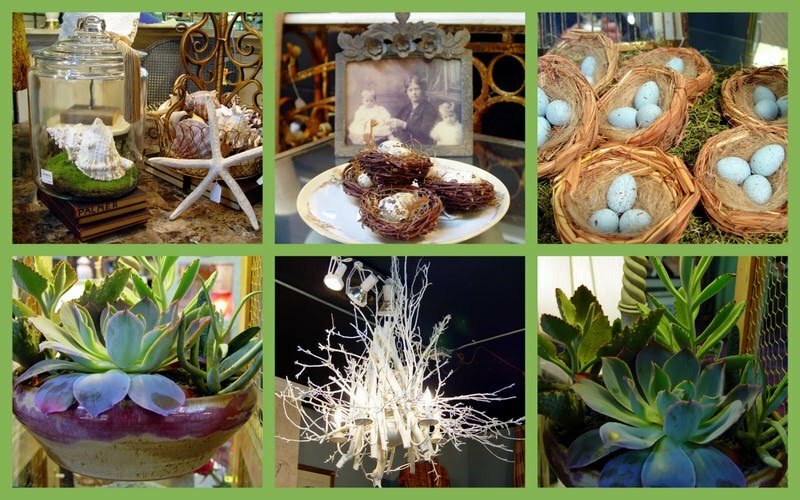 Succulent plants become elegant centerpieces when planted in a low dish or bowl. They require little care, yet bring a touch of freshness to any room. Take a look around your living spaces, then take a walk outside and see what you can find to bring some 'down to earth' freshness into your home decor! and I do so plan to enjoy this summer coming up...our spring is hardly anything to boast of as we have periodic snow...enjoyed my visit as always! How wonderful to visit your blog! I shall enjoy discovering all about Gracious Hospitality. Thank you for such lovely posts to enjoy my morning coffee with! I love,love bringing nature indoors. It reminds me that we are all tender. There is an award for you at my blog unless you are award free - then there is just applause! The other day I walked through two home decorator shops and noticed how they were both using seashells. They were beautiful and I love bringing nature into our home.